I love that it was a tricky angle to get this shot. I love that the feather is pointing to the cross. I love the cream, blue and patina colors. I love the wispy clouds in the blue sky. 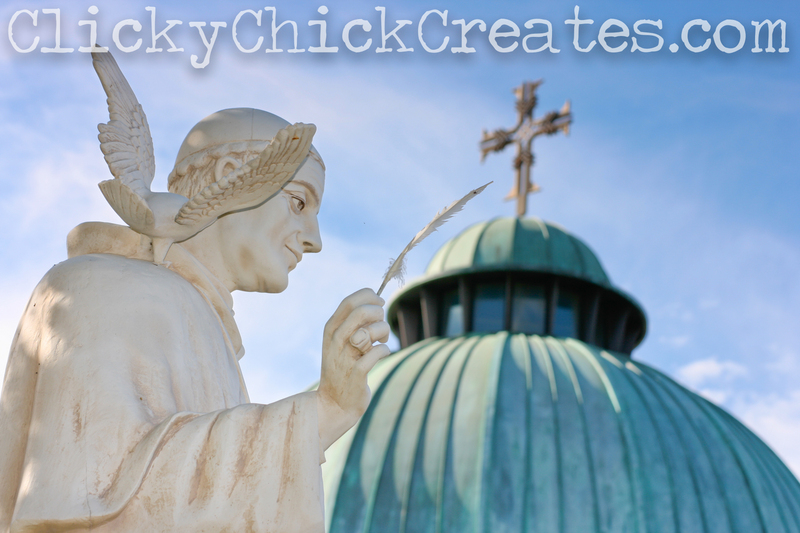 I love the details in the St. Gregory the Great statue. Love, love, love! While in Paris earlier this month, we visited Notre Dame. You know, that tiny little church, that’s just a few years old? No really, that amazingly large and beautifully designed French gothic, 850 year old Roman Catholic cathedral, near the Seine. There’s so much age, history and richness in those walls. 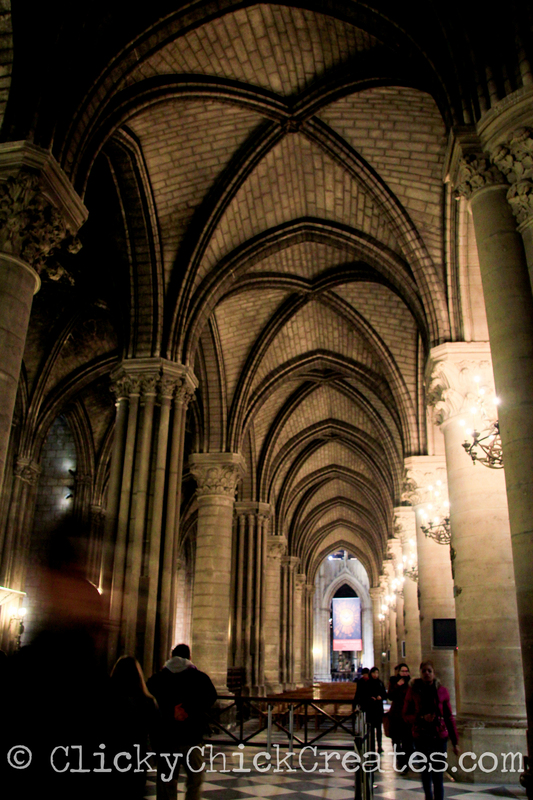 While inside Notre Dame, I was inspired to photograph the texture of the walls, with the vision to add the texture to the St. Greg photo in particular. I wasn’t sure what result I’d get, but I have to say: I am so in love with the way it come out! How did I do that, you ask? I opened up both files in Photoshop (I use CS6). I dragged the texture image into the St. Greg image, creating a new layer. 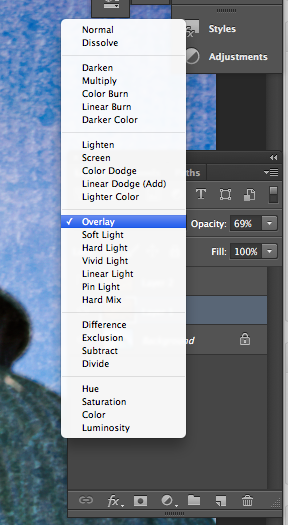 Selecting the wall/texture layer in the “Layers” dialog box, I changed the opacity to 69%, and changed the blending mode on the layer from “Normal” to “Overlay” – just left of the “Opacity” dropdown menu. That’s it! I saved the file and I’m all done! 5. Save as new file! And that’s how my texture got all medieval on ya! As my girls say: easy-peasy, lemon-squeezy! If you haven’t added texture to any of your photos, you’ve gotta give it a try! Just be sure to save your file under a new name. 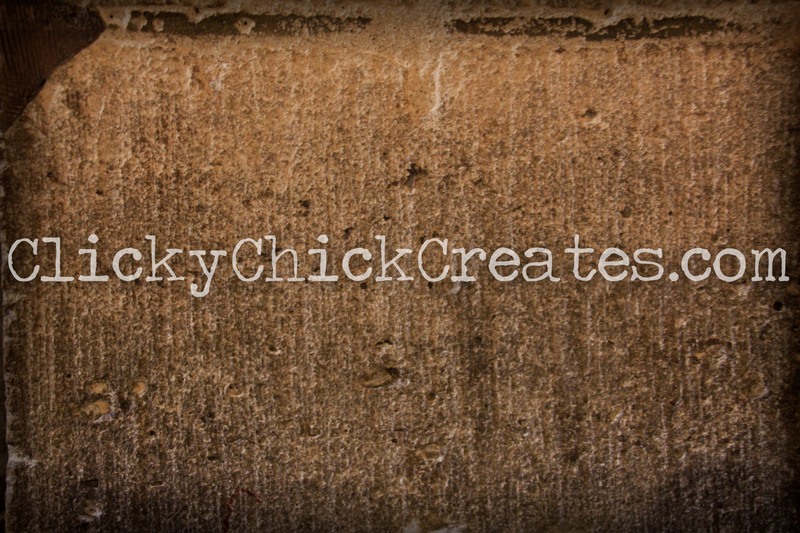 Thanks for stopping by and have a joyful, creative, blessing filled day! Make it a very good, Good Friday! For many years, pretty stationary was my addiction. I always had the greatest intentions to write notes to friends and family. But even with such great intentions, I have to admit, not very many were actually ever sent out. As such, I have a huge box of unused note cards, journals and notepads. So what’s a crafty girl to do? Reimagine them of course! 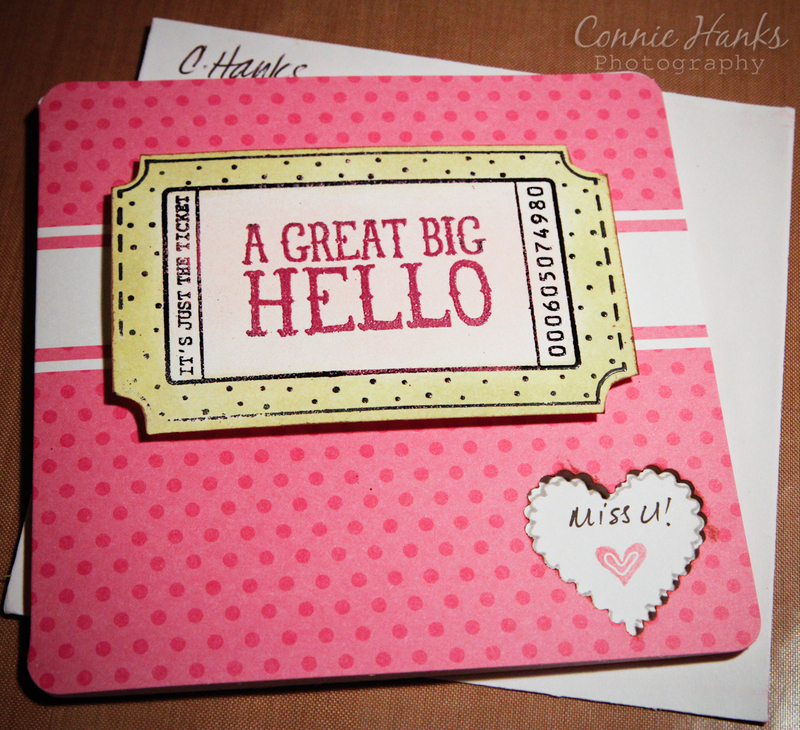 I had these pretty square, pink cards beckoning me to do something with them. So I pulled out my “Big Ticket” stamp set from Hero Arts. 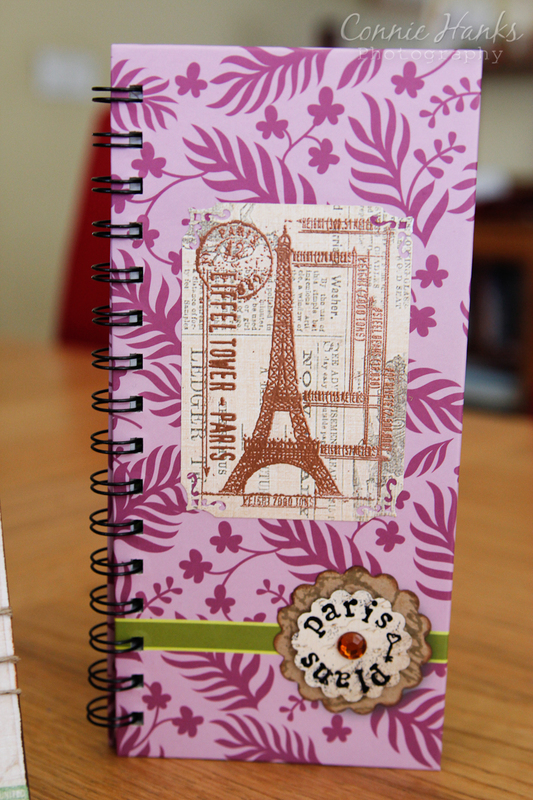 Using VersaMark waterstamp, and two embossing powders (black and pink), I created the ticket on plain white cardstock. 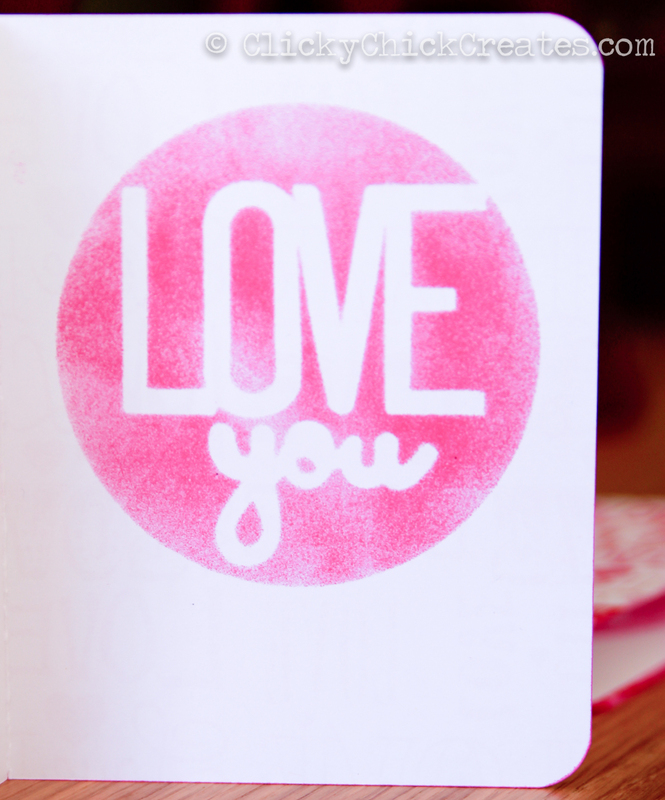 I used black embossing powder on the outer portion of the ticket and pink for the sentiment in the middle. 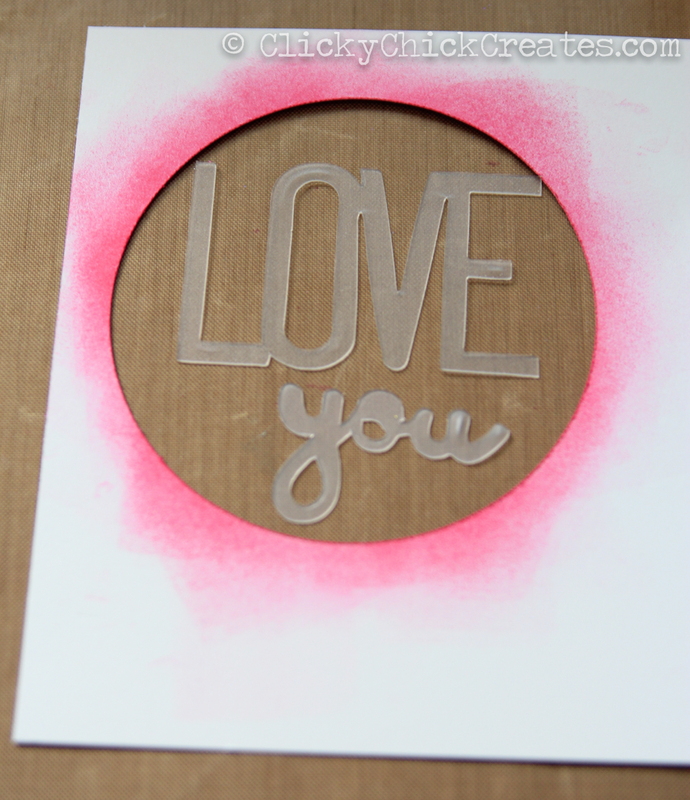 Using my go-to blending tool and Tim Holtz Distress Ink in Shabby Shutters, I added a little color to the ticket as well. I popped on some foam squares and set it right in the middle of the white border on the card. It still needed a little more oomph, so I used a scalloped heart punch on the bottom right corner, added some doodling, little heart stamp, and hand-written sentiment. Voila, custom card created! Here’s a super cute journal I had on hand and decided to doctor it up for a birthday present for a dear friend. The journal was from Michael’s dollar bins, and although it had a cute screen printed flower detail, I wanted to customize the journal for an upcoming trip my friend was planning. 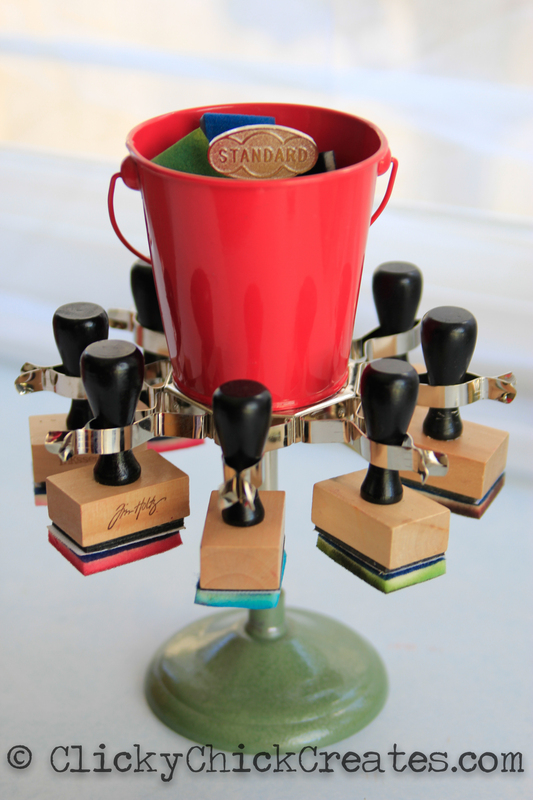 Out came my Tim Holtz Visual Artistry “French Market” stamp set. I love the blue print of the Eiffel Tower. Using a vintagy/newspaper print paper scrap I had left over from the crafts we made for my sister’s wedding, I stamped the design, again using VersaMark, and this time I used a copper embossing powder. I used a fun little corner punch to give it a little more oomph. Looking at it now, I should’ve distressed the edges to make those pop, but that’s what’s so great about this craft, right? Learning, learning, learning! 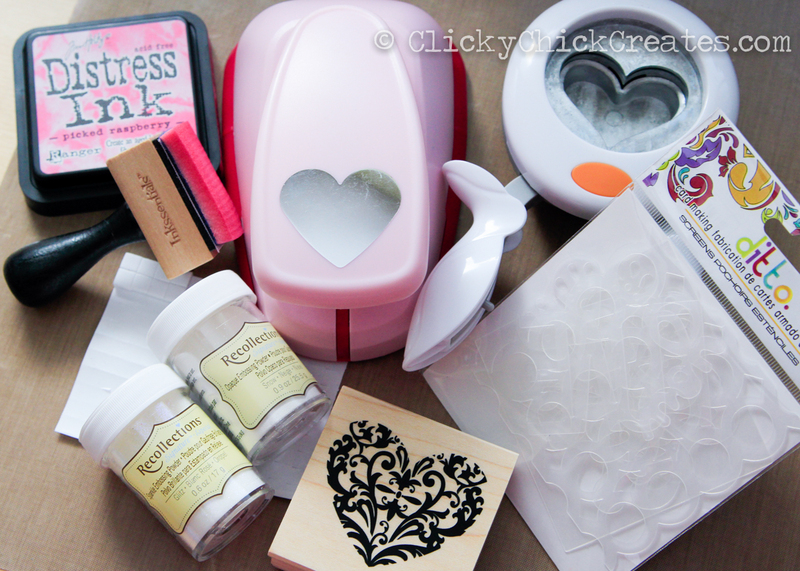 I used my Fiskars scalloped punches in Large and X-Large to create the little button on the bottom right. 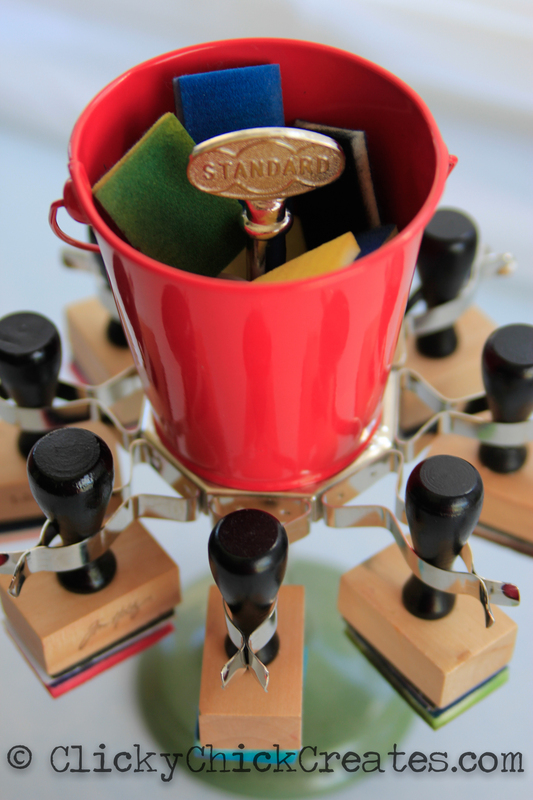 And using typewriter font stamps to create my title, I layered the pieces and added a little bling to finish the project. What kind of “doctoring” have you done to take pre-made note cards all your own? I’d love to see! I do this every holiday. 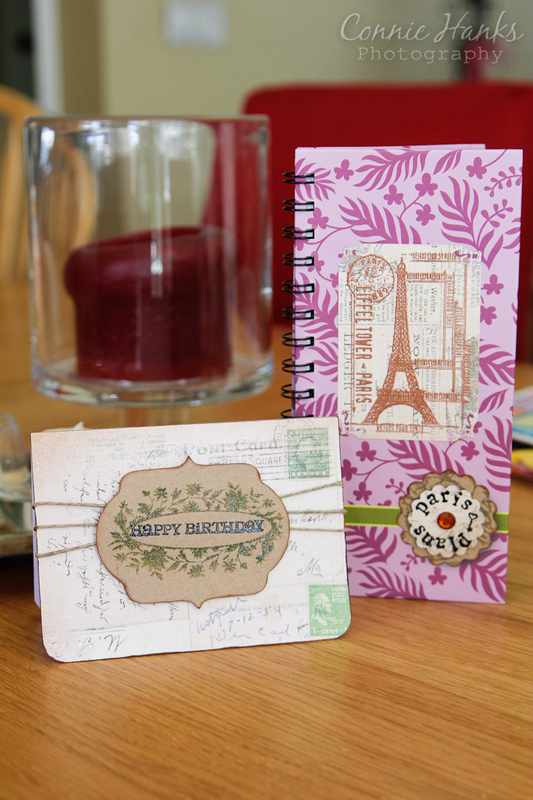 I have big dreams of making tons of items – decor, cards, tags – and time just completely sneaks away from me. Luckily, this time, I got my cards in the mail, just in time! My girls have been sick and I’ve been feeling a tad rundown, so we all just stayed home today. No school. No gym. No errands. Jammies all day – woohoo! In the MOMs (Ministry of Mother’s) group I belong to at church, we had a wonderful marriage therapist come talk to our group last week, and her topic was building forts (or a safe haven) for our marriages. This made me realize that my girls had never built a fort! Sure, we’ve built plenty of clubhouses, even a pretty fancy one in our backyard, but never an old fashioned fort with chairs and a sheet. So we started our morning with a yummy breakfast, then got busy building a fort. I knew they’d love it, but I had no idea that meant I’d actually have the morning to think! Yes, just think about my day, rather than trying to keep up with the chaos. With my thinking time, I figured I needed to get started on Valentine’s cards for the grands and sibs. I immediately went to check out Kristina Werner videos – she always inspires me! I took a little of this, a little of that and came up with the card above. 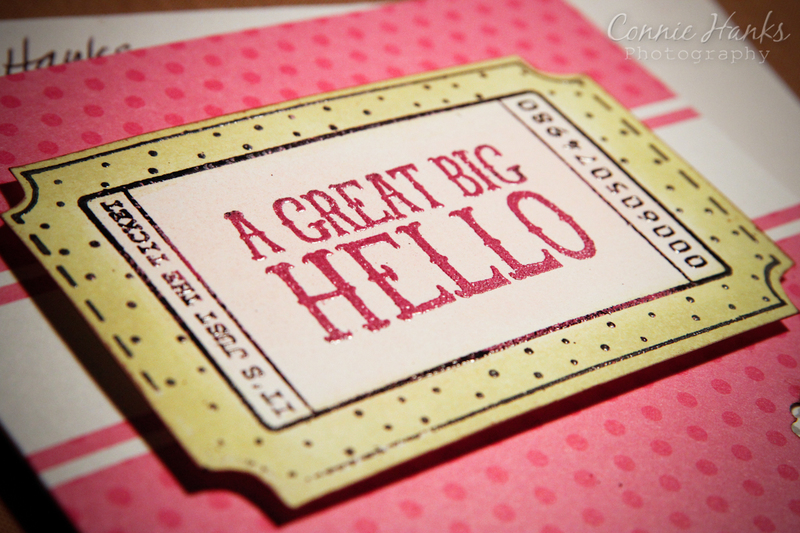 I started with an 8-1/2″ x 11″ piece of patterned cardstock, cutting it in half so I had two pieces of 8-1/2″ x 5-1/2″ pieces, which I then scored into 4-1/4″ x 5-1/2″ cards. I punched two large hearts on pink cardstock, chalked the edges in white and added dash lines (faux stitching) in red marker. 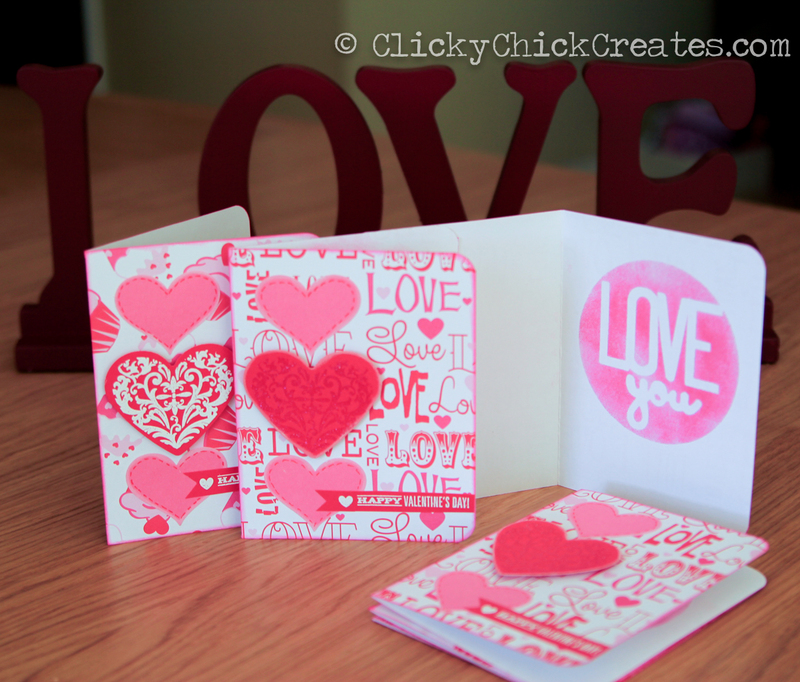 Using VersaMark and Snow (white) embossing powder, I embossed the Happy Valentine’s Day sentiment on red cardstock. I trimmed the paper to under half inch and cut out a little notch on the left side end. Using the blending tool, I inked the edges of the entire card in picked raspberry. 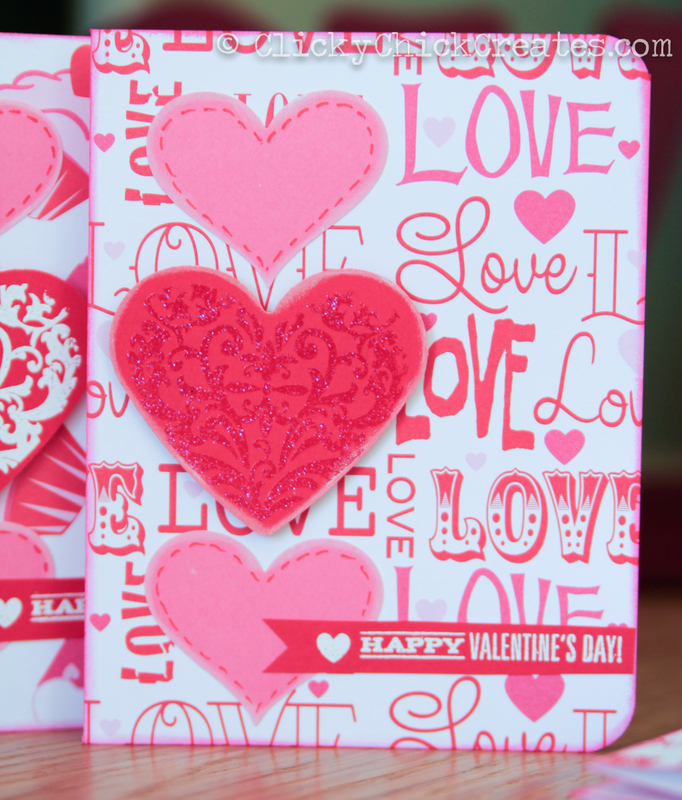 Next, I glued down the pink hearts and sentiment, then added foam squares to pop the embossed heart. Clearly, holding the stencils in place with my hands meant I got a little inky today, but what’s not to love? I can’t wait to use this technique again… soon! Thank goodness for forts! The girls kept busy and I ended up making six of these cards for our loved ones. Have I mentioned I love the way they came out?!?! 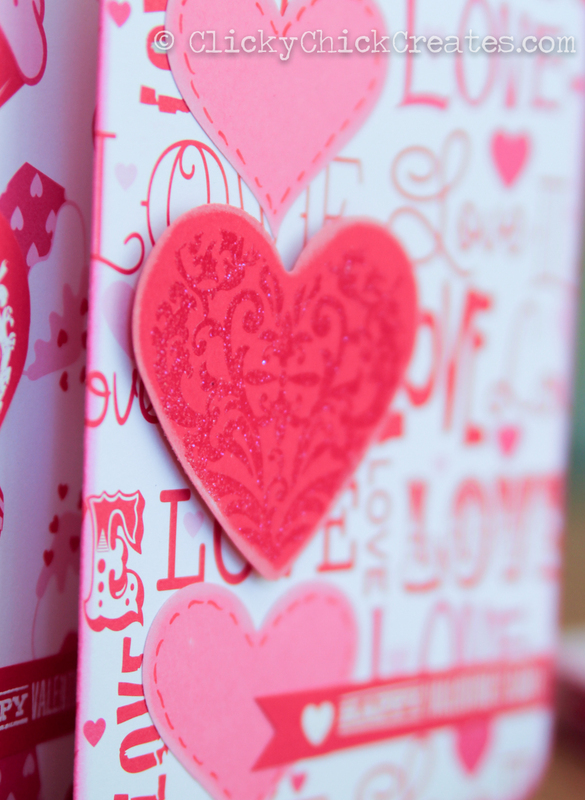 What Valentine’s crafts kept you busy? Cards? Decor? Gifts? I’d love to hear and even see, so share in the comments below!